Dan Halloran is running for City Council in Queens, NY. He’s the Republican candidate opposing Democrat Kevin Kim in their race to replace the outgoing councilman, Democrat Tony Avella. 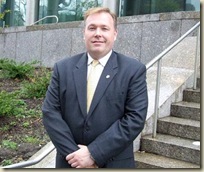 Halloran is a partner at a Long Island law firm and chairman of the state Republican Liberty Caucus. He’s also been endorsed by the Queens County Republican Party. That all sounds pretty standard, right? I thought so, too. So what’s special about this situation? Halloran is a practitioner of Theodism, a pre-Christian pagan religion that believes in “the Gods and Goddesses of the North, spirits of the land and the memories of our ancestors.” A little bit of reading finds that some of the important principles of Theodism are wisdom, generosity, honor, and hospitality. There’s also some animal sacrifice involved, but it seems to be more of a feast type activity where the “any meat left over is burnt for the gods.” The feast is followed by ritual drinking… which is stopped before “the religious nature of the event doesn’t degrade to a drunken party.” So far, so good. One would think that Christians (and, by proxy, Republicans) would be outraged by Halloran’s candidacy, but amazingly, that’s not the case. In this article at YourNabe.com, borough Republicans are supporting Halloran and are upset over the characterization of his religion in a Queens Tribune article. Tabone said Halloran was raised in an Irish Catholic household and that his religion would have no bearing on the Council race. I think I like this Tabone guy. It seems he’s all for keeping religion out of politics and allowing candidates to focus on the issues and how to best help the community. That’s admirable. New York State Republican Senator Frank Padavan also feels the same way. He said that Halloran’s religion wasn’t relevant and had this to say. Queens has every conceivable religion on the face of the Earth and as long as they are honorable toward their basic goals, then that’s all anyone should be concerned about. Our Constitution provides freedom of religion and as long as they don’t run counter to the law of the land, then it’s not something that should be at all political. Anybody who makes it political is suspect. I’d rather someone have a religion â€” even if it’s not a mainstream religion â€” than their being atheist. Did he actually say that? I’m not sure. Other than the YourNabe.com article, I can’t find another reference to this quote, so I don’t want to jump the gun. I found the same quote, but excluding the last sentence, so I’m not sure if one source left the line out of the quote or if one source added the line. However, the implications of the line are not insignificant. Without it, it shows a surprising amount of religious tolerance and open mindedness by Padavan. With the line, it puts him firmly in the stereotypical, atheist-hating, religious camp. If anyone can find another reference to the quote, let me know.